If anyone doubted that the US shale industry has completely upended the oil market, just look at how it’s complicating Opec’s next meeting. As the Organization of the Petroleum Exporting Countries (Opec) prepares to decide on 30 November whether to extend oil production cuts to the end of 2018, it has no idea how much competition to expect from shale. Nor does anybody else, for that matter. Forecasting output growth used to be a relatively simple undertaking. Developing oil fields had a lead time of several years and the flow of new oil coming from them was reasonably visible over a 12-month horizon. Now, lead times are measured in weeks rather than years for new shale projects, and the large number of companies operating in the sector have made forecasting oil output growth almost impossible. The uncertainty makes it very difficult for Opec and its friends to assess how they should respond. This raises a risk that they hesitate on extending the production reductions. Analysts briefing the group last week said forecasts of growth in shale oil output next year ranged from 500,000 barrels a day to 1.7 million. That margin of uncertainty is as big as the entire output cut the group agreed to a year ago. The group doesn’t just have a problem with looking ahead. Understanding of the current year is little better. The US Energy Information Administration is underestimating this year’s growth in shale oil output by about 300,000 barrels a day, according to veteran crude trader Andy Hall, who was part of the briefing. But Continental Resources Chief Executive Officer Harold Hamm said during an EIA webinar earlier this month that the department’s 2017 exit rate of production is 220,000 barrels a day too high, implying it is also overstating annual average output. Adding to the complexity, Opec and the International Energy Agency have very different global projections for next year. 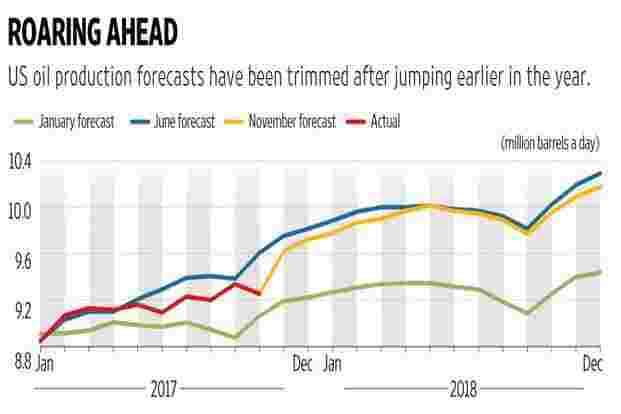 If output cuts are extended to the end of 2018, the producer group sees oil inventories reducing quickly in the second half of the year. 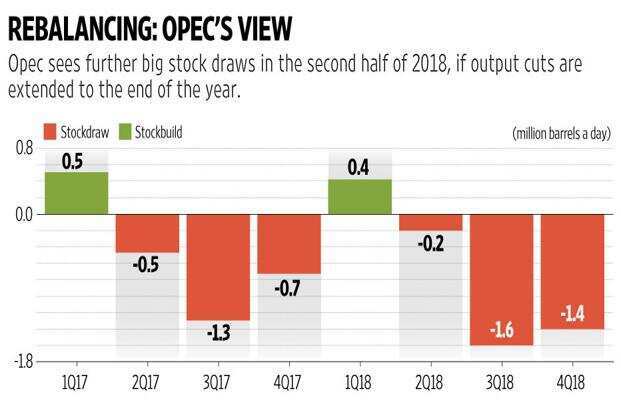 With an estimated 154 million barrels of excess inventory in the OECD (Organisation for Economic Co-operation and Development) countries alone, those steep reductions are still needed to bring stockpiles down to the five-year average level that Opec seeks. 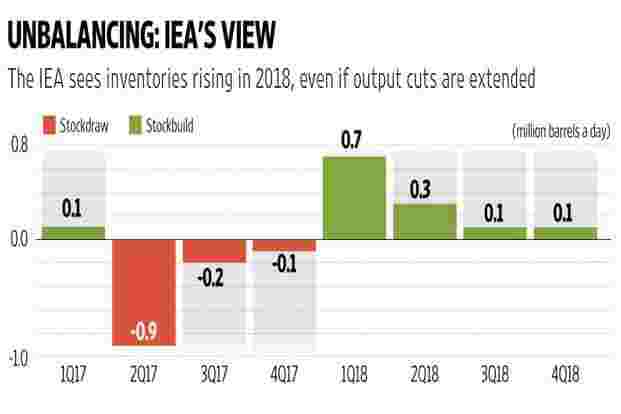 But the IEA, a group of OECD oil-consuming nations, sees global inventories increasing at a rate of 700,000 barrels a day in the first quarter of 2018 and continuing to rise throughout the year. Opec is a little more optimistic about the strength of oil demand growth in 2018, seeing it slightly above 1.5 million barrels a day, compared with almost 1.3 million currently projected by the IEA. But the much bigger difference lies in the assessments of production. Here, Opec is much less optimistic than the IEA. While the latter sees non-Opec output growing by more than 1.4 million barrels a day next year, the producer group sees an increase of less than 900,000 barrels. So how should Opec and friends respond to such uncertainty at this month’s meeting? It should resist the temptation to delay a decision on extending its current output deal until the picture becomes clearer, because the situation isn’t going to get any clearer. The widely differing assessments of this year’s growth in shale output show that even by the first quarter of next year, there will be no unified view of 2018. Opec’s decades-old policy of acting as the world’s swing producer has run out of steam—at least so long as the US shale sector is able to respond rapidly to movements in the oil price. The aim of current Opec policy, shared with some other countries, is to force a drawdown of inventories to their five-year average level. They have yet to achieve that objective. If it remains their target, then their path should be clear. They need to extend the cuts this month. Developments on Friday suggest the waverers are starting to come around to that way of thinking.